State Snapshot Transfer (SST) is a mechanism intended to provision or rebuild Galera nodes. There are a couple of ways you can execute SST, including mysqldump and rsync. The most popular one, though, is to perform SST using xtrabackup - it allows the donor to stay online and makes the SST process less intrusive. Xtrabackup SST process involves streaming data over the network from the donor to the joining node. Additionally, xtrabackup needs access to MySQL to grab the InnoDB log data - it checks ‘wsrep_sst_auth’ variable for access credentials. In this chapter we are going to cover examples of problems related to SST. Sometimes it may happen that the credentials for MySQL access, set in wsrep_sst_auth, are not correct. In such case SST won’t complete properly because xtrabackup, on the donor, will not be able to connect to the MySQL database to perform a backup. You may then see the following symptoms in the error log. Let’s start with a joining node. So far we have the standard SST process - a node joined the cluster and state transfer was deemed necessary. 2015-11-13 10:40:57 30484 [Warning] WSREP: Gap in state sequence. Need state transfer. 2015-11-13 10:40:58 30484 [Note] WSREP: wsrep_notify_cmd is not defined, skipping notification. 2015-11-13 10:40:58 30484 [Note] WSREP: Service thread queue flushed. 2015-11-13 10:40:58 30484 [Note] WSREP: Member 0.0 (172.30.4.220) requested state transfer from '*any*'. Selected 1.0 (172.30.4.156)(SYNCED) as donor. IST was not available due to the state of the node (in this particular case, the MySQL data directory was not available). The remaining files from the data directory were removed, and the node started to wait for SST process to complete. 2015-11-13 10:41:08 30484 [ERROR] WSREP: Failed to read uuid:seqno from joiner script. 2015-11-13 10:41:08 30484 [ERROR] WSREP: gcs/src/gcs_group.cpp:gcs_group_handle_join_msg():731: Will never receive state. Need to abort. Unfortunately, SST failed on a donor node and, as a result, Galera node aborted and the mysqld process stopped. There’s not much information here about the exact cause of the problem, we’ve been pointed to the donor, though. Let’s take a look at it’s log. 2015-11-13 10:44:33 30400 [Note] WSREP: Member 0.0 (172.30.4.220) requested state transfer from '*any*'. Selected 1.0 (172.30.4.156)(SYNCED) as donor. 2015-11-13 10:44:33 30400 [Note] WSREP: wsrep_notify_cmd is not defined, skipping notification. In this part of the log, you can see some similar lines as in the joiner’s log - joiner (172.30.4.220) is a joiner and it requested state transfer from 172.30.4.156 (our donor node). Donor switched to a donor/desync state and xtrabackup has been triggered. At some point SST failed - we can see a hint about what may be the culprit of the problem. There’s also information about where we can look even further for information - innobackup.backup.log file in MySQL data directory. 2015-11-13 10:44:43 30400 [Note] WSREP: Member 1.0 (172.30.4.156) synced with group. All SST-related processes terminate and, the donor gets in sync with the rest of the cluster switching to ‘Synced’ state. Failed to connect to MySQL server: Access denied for user 'root'@'localhost' (using password: YES). This time there’s nothing new - the problem is related to access issues to MySQL database - such issue should immediately point you to my.cnf and ‘wsrep_sst_auth’ variable. Sometimes it may happen that streaming doesn’t work correctly. It can happen because there’s a network error or maybe some of the processes involved died. Let’s check how a network error impacts the SST process. First error log snippet comes from the joiner node. 2015-11-13 14:30:46 24948 [Note] WSREP: Member 0.0 (172.30.4.220) requested state transfer from '*any*'. Selected 1.0 (172.30.4.156)(SYNCED) as donor. 2015-11-13 14:46:30 24948 [ERROR] WSREP: gcs/src/gcs_group.cpp:gcs_group_handle_join_msg():731: Will never receive state. Need to abort. 2015-11-13 14:46:30 24948 [Note] WSREP: /usr/sbin/mysqld: Terminated. Warning: Using unique option prefix open_files instead of open_files_limit is deprecated and will be removed in a future release. Please use the full name instead. Pipe was broken because the network connection timed out. In the case described above, as can be clearly seen, xbstream was killed. 2015-11-13 15:43:11 9717 [ERROR] WSREP: Failed to read uuid:seqno from joiner script. This time it’s much more clear - we have an error in xtrabackup_copy_datafile() function which, as you may expect, is responsible for copying files. This leads us to the conclusion that some kind of network connection issue happened between donor and joiner. Maybe not a detailed explanation but the conclusion is still valid - killing the process which is on the other end of the network connection closes that connection abruptly - something which can be described like a network issue of some kind. We are approaching the end of this post - hopefully you enjoyed our small trip through the Galera logs. As you have probably figured out by now, it is important to check an issue from every possible angle when dealing with Galera errors. 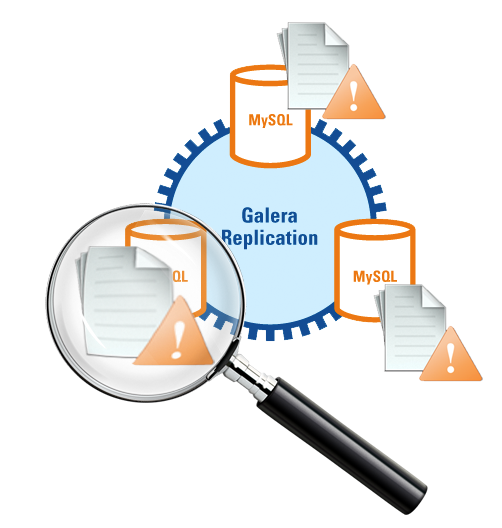 Galera nodes work together to form a cluster but they are still separate hosts connected via a network. Sometimes looking at single node’s logs is not enough to understand how the issue unfolded - you need to check every node’s point of view. This is also true for all potential issues about SST - sometimes it’s not enough to check logs on a joiner node. You also have to look into the donor’s logs - both error log and innobackup.backup.log. The examples of issues described in this post (and the one before) only covers a small part of all possible problems, but hopefully, they’ll help you understand the troubleshooting process. In the next post, we are going to take a closer look at pt-stalk - a tool which may help you understand what is going on with MySQL when the standard approach fails to catch the problem.